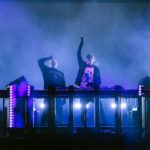 Though Dada Life, the jubilant Swedish duo of Olle and Stefan, did not bring their champagne and bananas to Ultra this year, their music certainly found its way into many a main stage set. Their remix to the Bingo Players’ “Out of My Mind” was one such tune that received its fair share of playtime during the festival. Emphasizing the Bingo Players’ easily recognizable melody, Dada Life provide a slamming electro house take on the popular single. With its powerful bassline and stuttered kicks, the remix has a bit of a darker edge in the way of R3hab or Dyro. It may not be their most original work yet, but it certainly inspired havoc on the colossal Ultra speakers last weekend.